Do you give presentations or speak publicly as part of your job? and persuasive in your speaking? Discover the keys to compelling, persuasive presentations that inspire action. Craft your message and deliver it with confidence, impact and authority. Develop your speaking skills for greater professional and personal success. If you use vocal communication (give presentations) as part of your job and want to be more engaging, dynamic, influential and effective, Bill Brown can help you! The words that you say are important, but so is how you say them. In fact, how you deliver them can make a significant difference in the effectiveness of your message. In this 25-week email series, Bill shares speech delivery tips gleaned from his many years in radio broadcasting, voice-over narration, and public speaking. 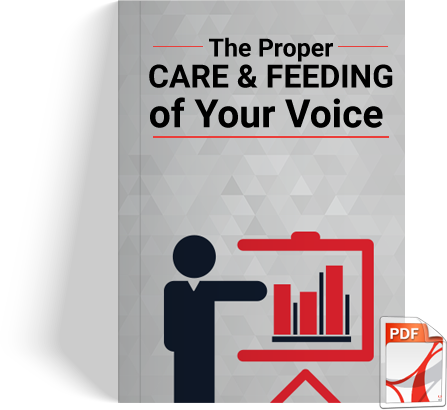 Learn how you can use your voice to captivate, motivate, influence, and inspire your audiences! As an added bonus, you will receive Bill’s voice care tips. Discover how to prevent vocal fatigue and keep your voice in peak condition so that it will be there when you need it!